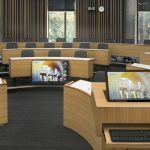 TEECOM design combines AV & other education technology in the new UCal Berkeley Connie and Kevin Chou Hall at the Haas School of Business. Ultra HD format goes beyond consumers and makes way into digital signage, control rooms and other B2B applications. The solutions could ease BYOD implementation for small companies or individual departments. Daktronics displays, networked content delivery and a robust Wi-Fi system set the new benchmark in arena design. These critical takeaways from CI Summit are must-dos for successful integration firms. Chili-cookoffs, Movember ‘stache challenges and failed drug tests — the ups and downs of a company’s culture. Ron Prier started RPAV hoping he could last a year. A decade later his integration firm has grown into a four-headed international enterprise.